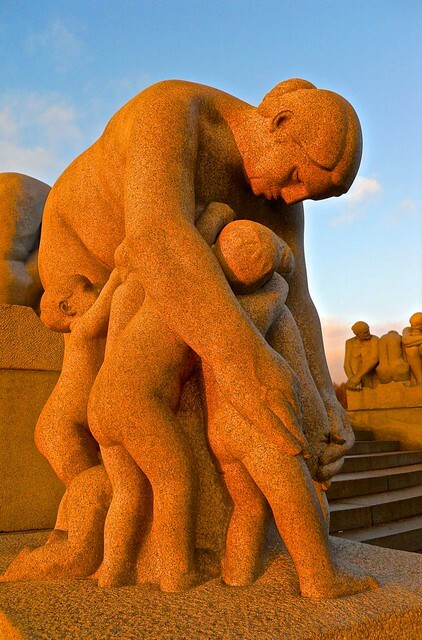 “The Water Mother”, by Danish sculptor Kai Neilsen 1919-21, best sculpture of the day, in Carlsberg’s Glyptotek Museum., Copenhagen. 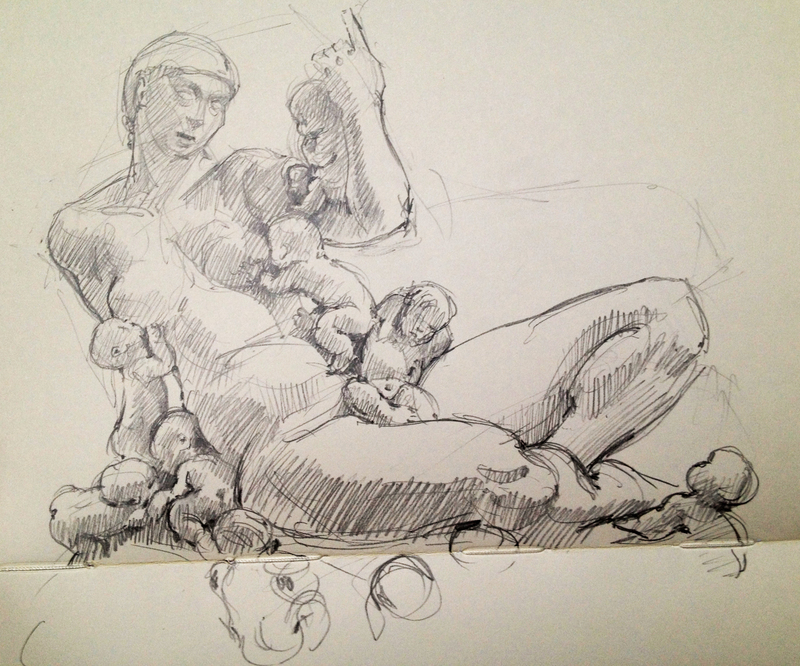 There were more babies to draw, but the museum was closing. Pencil in 5″ x 8″ Moleskine Sketchbook. Ny Carlsberg Glyptotek is a Copenhagen museum founded by the Carlsberg brewing family, with sculpture being the main attraction, but they also have great French Impressionist paintings, a tropical garden in the main rotunda, a nice cafe, and today, a surprise choral group in the marble-columned music hall singing heavenly music straight out of the Middle Ages. I wasn’t the only one sketching there today- a drawing class commenced in the Egyptian room, and individual sketchers occupied the Classical Antiquities Hall. 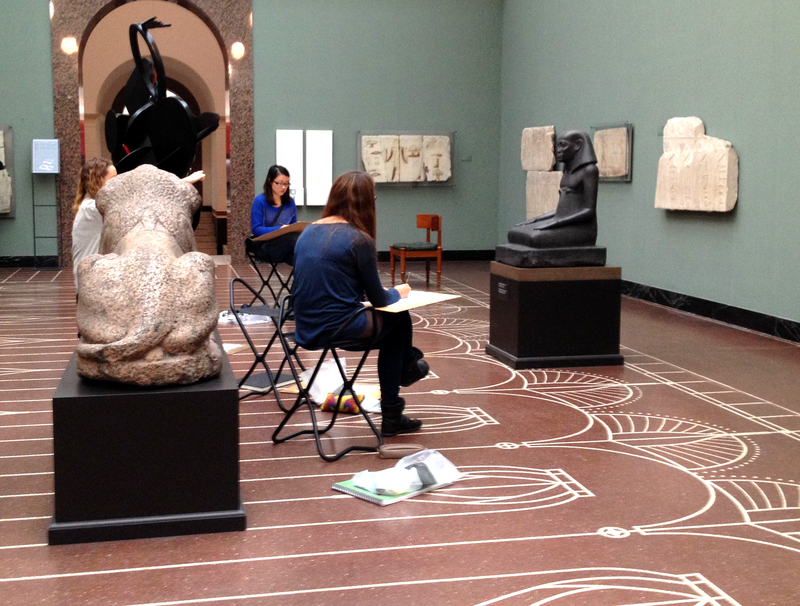 Sketchers draw in the Egyptian Room at Copenhagen’s Ny Carlsberg Glyptotek. The Glyptotek encourages artistic visitors and even hands out folding seats. I beamed with gratitude, sat down, and drew an Athenian Soldier, circa 330 BC, followed by the most amazing mother and child free-for-all ever sculpted. What a great place, and wow what a sculpture. Great work capturing it and a fascinated baby in that photo!